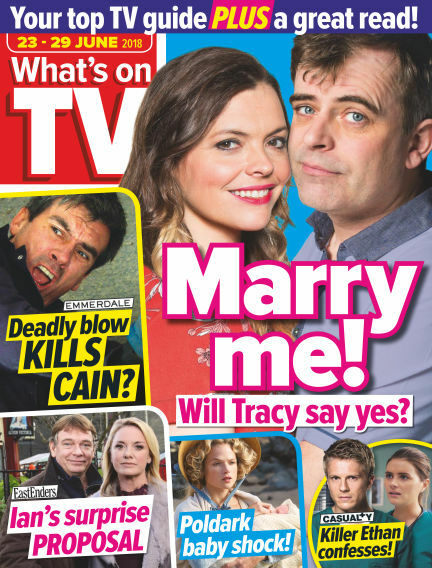 In this issue of What's on TV : What's on TV provides over 3.4 million readers a week with a great value mix of entertaining TV features, the latest soap news and gossip, plus puzzles, competitions and easy-to-use TV listings. Bright, friendly and great value, What's on TV offers a no-nonsense, entertaining guide to TV for all the family. WhatsonTV.co.uk with its focus on story updates, photos, video and news relating to soaps and popular UK TV, is the perfect online destination for the brand. Other touchpoints include a mobile optimised website, Facebook and Twitter. With Readly you can read What's on TV (issue 26th June 2018) and thousands of other magazines on your tablet and smartphone. Get access to all with just one subscription. New releases and back issues – all included.